M T D O c t o b e r 2 0 1 8 68 F o c u s O n I n d u s t r y O n Monday, Sept. 10, 2018, t h e 1 , 0 0 0 t h D i s c ou nt Tire store was opened. The milestone occurred in Phoenix, Ariz., on the corner of 23rd Ave. and Happy Valley Road. 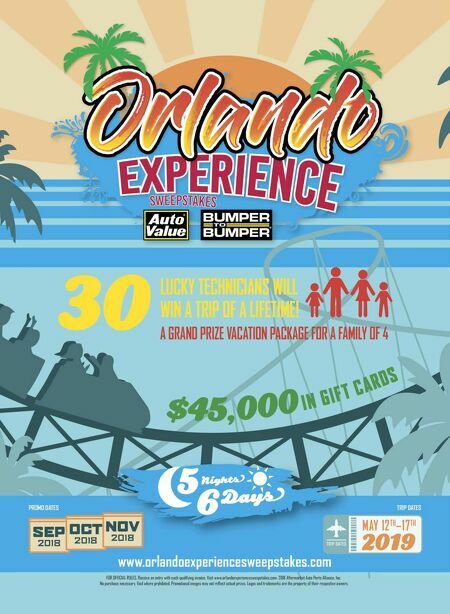 "Reaching 1,000 stores is truly a testa- ment to Bruce Halle's dream and com- mitment to treating people right," said Lisa Pedersen, assistant vice president of marketing at Discount Tire. Built from the ground up, the store is in close proximity to a car wash and an outdoor shopping center occupied by the likes of Walmart, Target, Kohl's and Best Buy. "It's in a perfect spot," said Gary Van Brunt, vice chairman. "It is in a growing, upscale area." With only six tires to his name, Halle, who was 87 when he died Jan. 4, 2018, opened his first Discount Tire store in Ann Arbor, Mich., in 1960. e company reached 200 stores in 1990 and 500 stores in 2002. Halle was named Modern Tire Dealer's Tire Dealer of the Year in 2014. At the time, he had 887 stores in 30 states, and said he hoped to have stores in at least 40 states, not including Alaska and Hawaii. Today the parent company, Reinalt- omas Corp., does business as Discount Tire (and America's Tire in parts of Cali- fornia) in 34 states. Discount Tire said it attributes its success "to the respectful, can-do attitude" that began at Halle's first store, and is instilled in each of the company's more than 20,000 employees. "Bruce always said, 'Once we get to 1,000, let's go open the next thousand — as long as we stay true to who we are,'" said Pedersen. "We will continue to responsibly grow and honor Bruce's legacy on which the company was built." Fittingly on the same day, Brad Kesel- owski, driver of the No. 22 Discount Tire car in the Monster Energy NASCAR Cup Series, won his first race of the season, e Brickyard 400, at Indianapolis Motor Speedway. ■ Retail tire store No. 1,000! AND DISCOUNT TIRE HOPES TO DOUBLE THAT Brad Randall is front and center at his new retail store, surrounded by his staff. The store is located near a number of big box stores and a popular car wash. Store Manager Brad Randall (left) of- ficially opens Discount Tire's 1,000 store as Michael Zuieback (center), Scott Fournier and Rich Sommer look on. 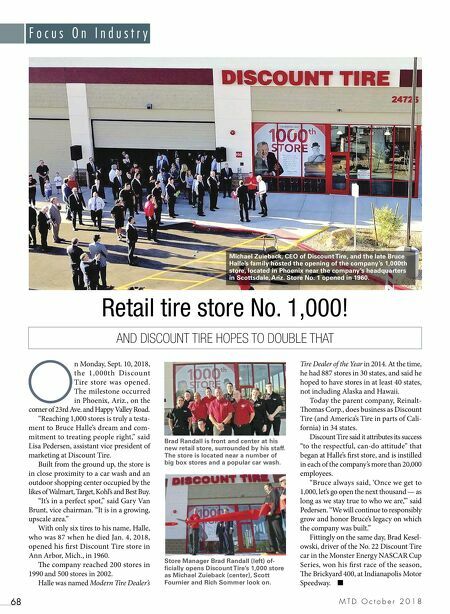 Michael Zuieback, CEO of Discount Tire, and the late Bruce Halle's family hosted the opening of the company's 1,000th store, located in Phoenix near the company's headquarters in Scottsdale, Ariz. Store No. 1 opened in 1960.